This is adapted from the simple recipe in Simon Hopkinson’s latest book The Good Cook. He uses butter and vermouth. 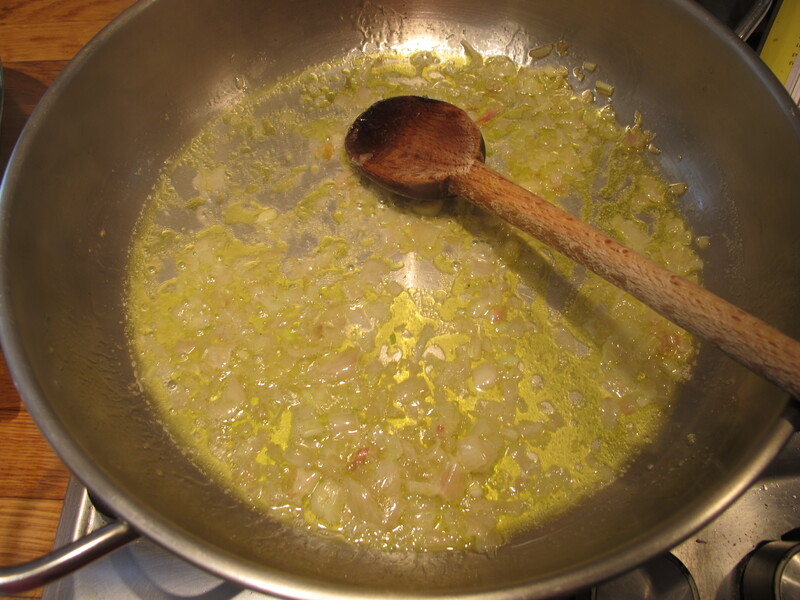 I’m trying it with olive oil and white wine–fits in better with my way of eating. 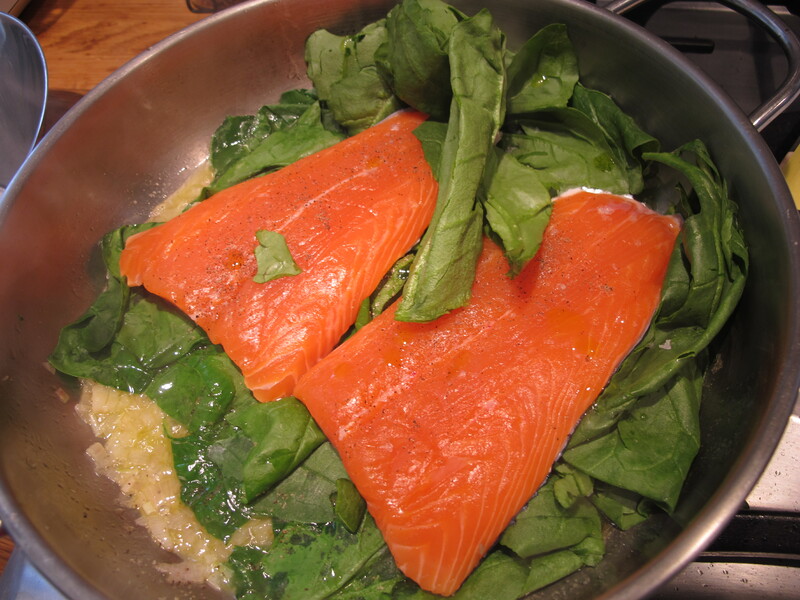 It’ll be different–but if the salmon and the spinach are good…. Meredith suggests I be a bit bolder with the nutmeg next time. Looks yummy! 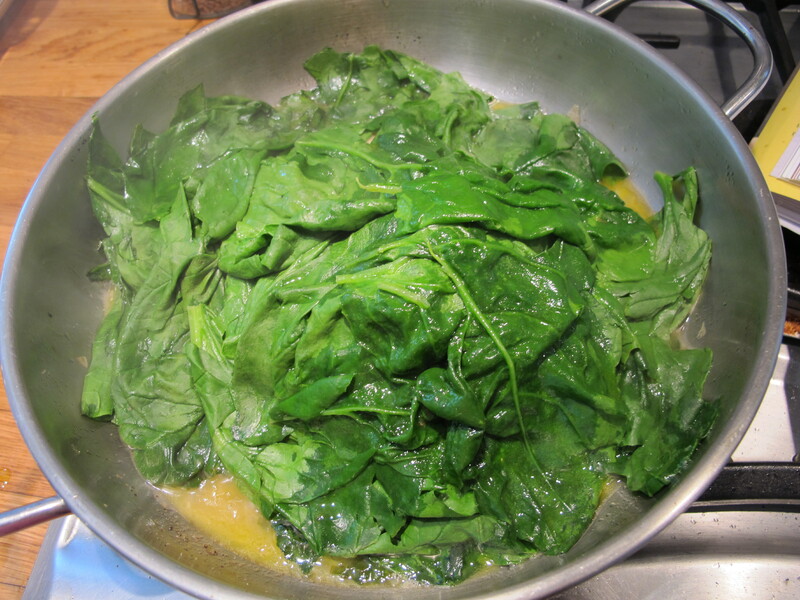 I’ll have to try that before my surgery on Wednesday–when this spinach lover will be banned from it for 1 month… I’ll take Meredith’s nutmeg hint, and add my NZ white wine for good measure. 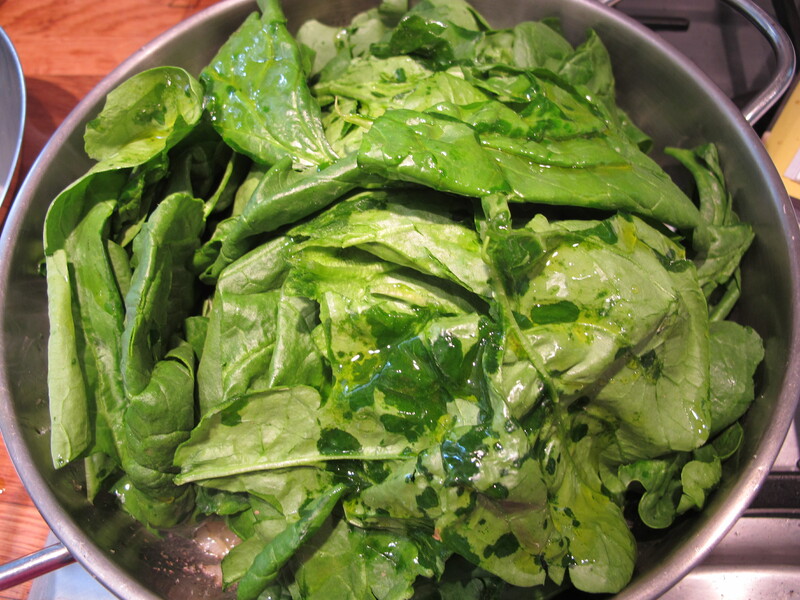 alsaskaandy, 😦 banned from spinach for a month eeek! Shallot? Not on ingredient list-never have bought one but eaten them. Do you just chop one up? Whoops sorry the shallot that got away! Wow–that looks so delicious can’t wait to try it! I adore one pot meals and this one seems to involve quick prep and quick clean-up. Perfect for a weeknight meal. Thanks for sharing. All this “boils down” to taste. 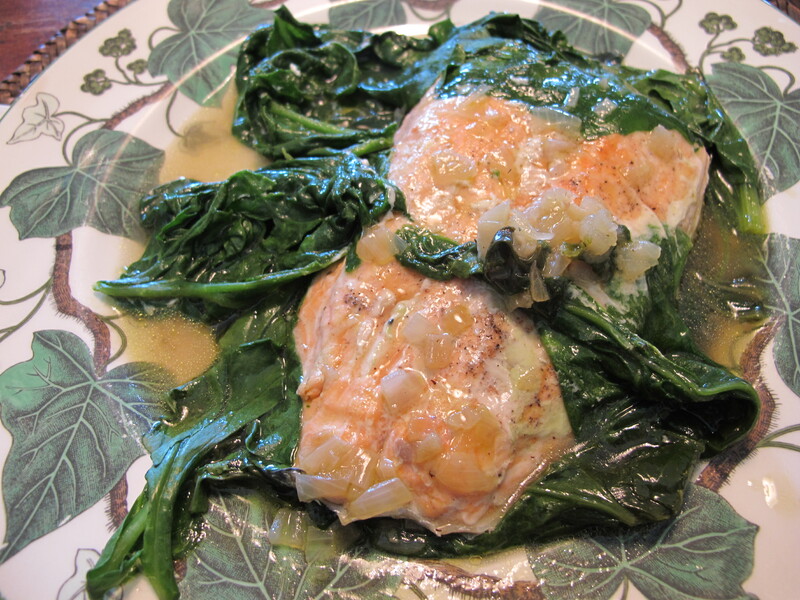 Olive oil and white wine are more suitable for fish. It’s an excellent idea for a healthy and quickly prepared meal. Thanks for the pictures–so helpful! Mmmmm. Tomorrow’s lunch, for sure. Thanks, Robin. By the way, your cookbook is great. I’ve bookmarked half the pages. 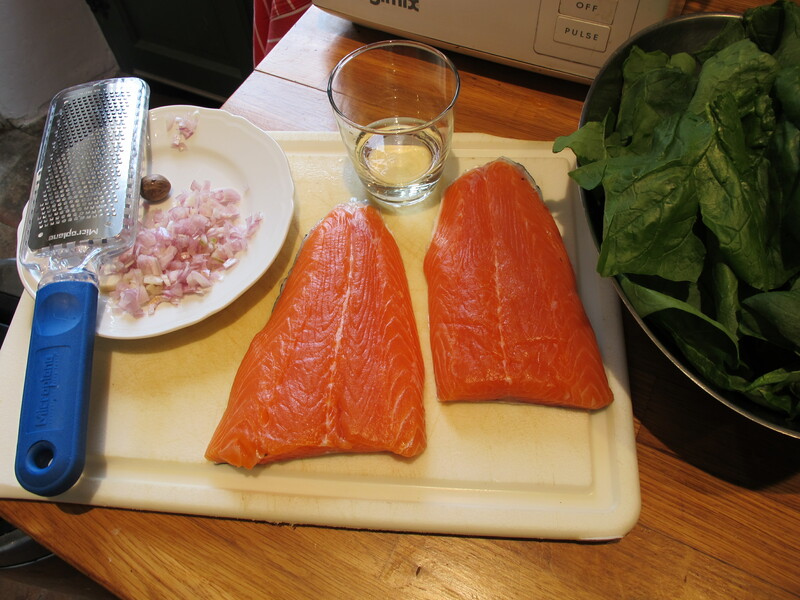 Looks beautiful – and the salmon fillets look huge in the photo! We bought farmed Scottish salmon this weekend in the USA because wild Alaskan salmon is now selling at $30 a pound!! They were a bit big I usually reckon 180gms/6oz is a good portion. on April 16, 2012 at 3:43 pm | Reply Dianne P.
A bit off-topic, but we were pleasantly surprised as we watched “Battle of Britain” (1969) last night…Has a star-studded cast w/Michael Caine, Christopher Plummer, Ralph Richardson, Trevor Howard, and others…and near the end, two fresh-faced, eager “recruits” appear–incl. Richard Morant! He has only one line, uncredited, but it was definitely him! Was hoping he’d have more screen time, but the characters are outnumbered in the air battle that ensues. Good movie, though, if you haven’t seen it! Hi Robin: I made this for dinner tonight. It was not only delicious but a quick one pot meal. Easy to make and cleanup was easy and a big taste payoff. Love your recipes! I keep looking for you book at the local Barne’s and Nobles here but it’s never there.